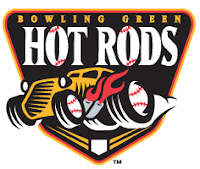 Bowling Green, KY – Tyler Bortnick celebrated his birthday in style on Saturday night at Bowling Green Ballpark by recording two hits and driving in one as the Hot Rods were victorious over the Fort Wayne TinCaps 6-4. The birthday boy also scored and walked twice as the Hot Rods finished their home stand 3-3. The game started with fireworks for both clubs as Danny Payne homered in the top of the first inning against Jason McEachern. In the bottom of the first, Hot Rods lead-off hitter Brett Nommensen answered Payne’s blast with a long ball of his own to tie the game at 1-1. Bowling Green tacked on a run in the bottom of the third against starter Nick Greenwood. Ty Morrison was hit by a pitch, went to third on a single by Nommensen, and then scored two batters later on Tyler Bortnick’s RBI single to left-center field to make it 2-1 Hot Rods. After putting runners on in the second, third, and fourth innings, the TinCaps finally tied it in the fifth when Jeudy Valdez homered with one out to knot the game at 2-1. That was all for McEachern, who worked five innings and allowed two runs on six hits. The only two runs he surrendered were the solo home runs, both coming on 1-2 pitches. McEachern walked three and struck out only two, but he held the TinCaps hitless with men in scoring position. McEachern left the game in line for the victory after the Hot Rods put up three runs in the last of the fifth against reliever Hayden Beard. Robi Estrada doubled and then took third on a wild pitch. Bortnick followed with a walk to put runners at the corners. That brought up Mark Thomas, who extended his hitting streak to 14 games with a single into right field. Estrada scored on the single while Bortnick scored from first base after the ball skipped by the right fielder to make it 4-2. Ryan Wiegand followed with a ground out to advance Thomas to third. Gabe Cohen then made it a three-run lead with a two-out double off the top of the left field wall to score Thomas. Jake Sullivan came on to pitch the sixth for the Hot Rods, giving up a run to cut the lead to 5-3. But after Sullivan threw a scoreless seventh, Bowling Green added an insurance run when Mark Thomas doubled and scored three batters later on an error by Fort Wayne’s shortstop, Valdez. Sullivan would hand the ball to Scott Shuman, the team leader in saves, for a chance to close the door. The former Auburn Tiger would allow an unearned run in the top of the eighth but would strike out the side in the top of the ninth to end the game for his twelfth save. The two clubs now hit the road and beginning a three-game series starting Sunday night at Parkview Field in Fort Wayne, IN. RHP Kirby Yates (1-2, 2.11) takes the ball for the Hot Rods on July 4 against Fort Wayne RHP Jerry Sullivan (3-6, 4.67). First pitch is at 6:05 PM CDT. You can listen to the game with Tom Gauthier beginning at 5:50 CDT on 1340 AM WBGN and www.bghotrods.com.